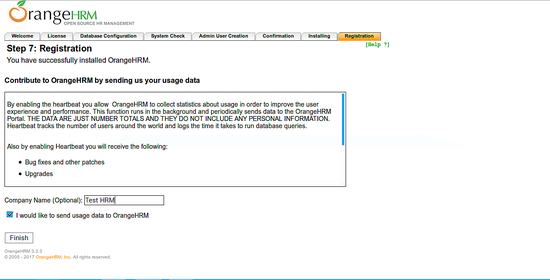 OrangeHRM is a widely used, web-based, open-source human resource management software that can be used to manages employee's attendance, performance, recruitment and annual appraisals. It supports both Linux and Windows operating systems. It comes with lots of features that fulfills all your human resource management needs. 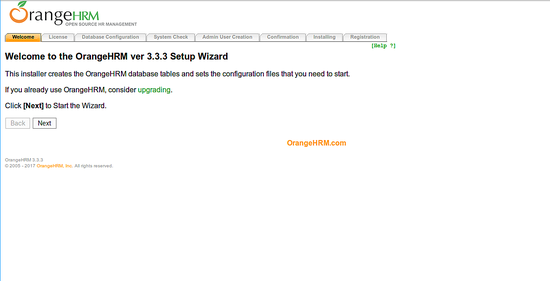 OrangeHRM comes in three editions Opensource edition, Enterprise Edition, and Professional edition. 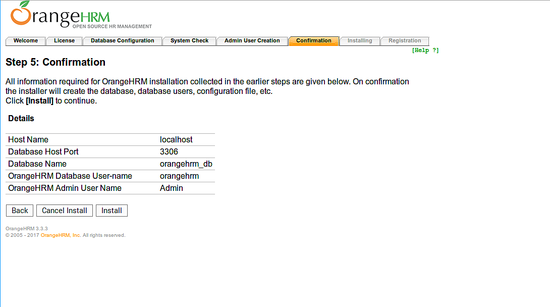 In this article, I will show you how to install OrangeHRM on an Ubuntu 14.04 server. Fresh Ubuntu 14.04 server installed on your system. PHP > 5.5.0 with Apache and MySQL/MariaDB. Before starting, it is recommended to update your system with the latest stable version. Once your system is updated, restart your system and login with sudo user. Once the installation is completed, you can proceed to install the MariaDB server. By default MariaDB is not secured, so you will need to secure it. You can secure it by running the mysql_secure_installation script. 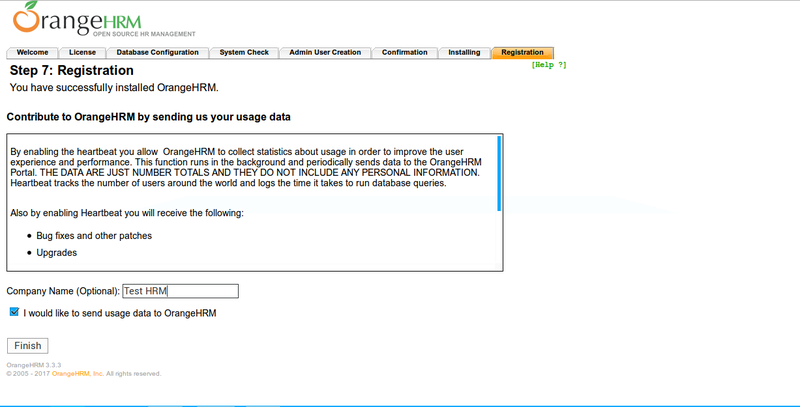 Once you are done, you can proceed to access OrangeHRM web interface. 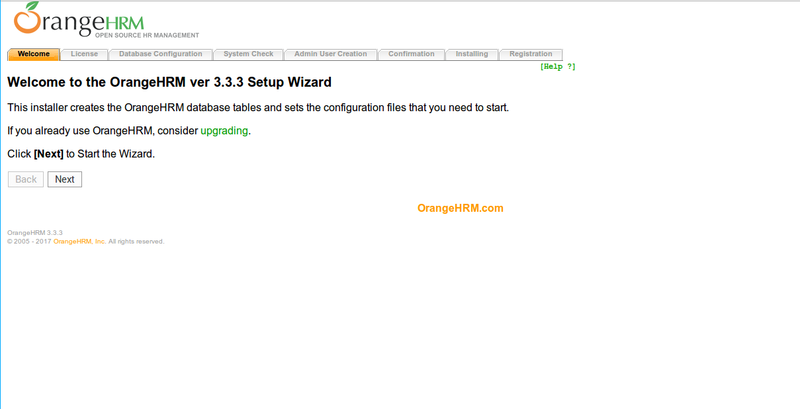 Now, open your favorite web browser and access the URL http://yourdomain.com, you will be redirected to the OrangeHRM web installation wizard as shown in below image. Click on the "Next" button. 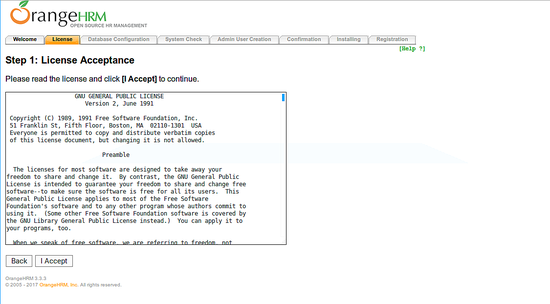 You should see the License agreement in below image. Now, click on the "I Accept" button. You should see the following page. 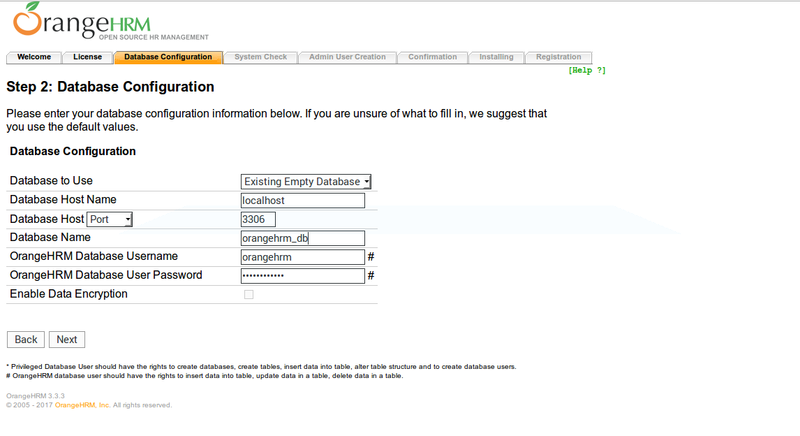 Enter your database configuration information such as Database Host, Database Port, Database Name, Username, and Password. Then click on the "Next" button. You should see the following page. 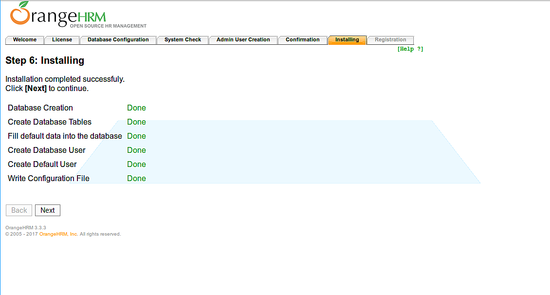 Make sure all of the system check items are green. Then Click on the "Next" button. You should see the following page. 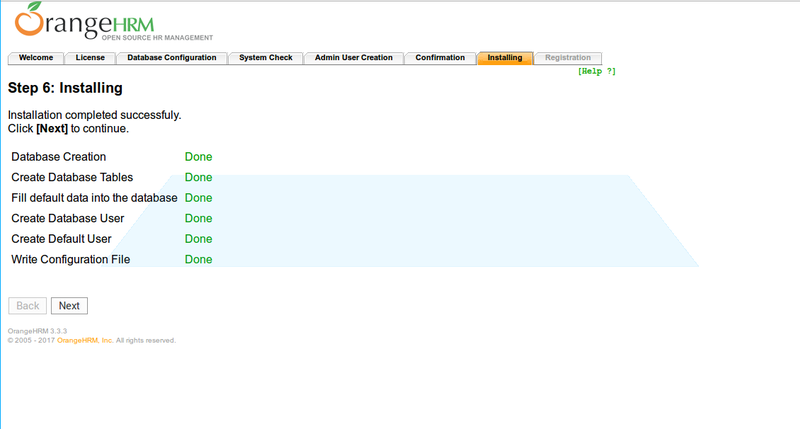 Provide your admin user details like admin username and password. Then click on the "Next" button. You should see the following page. Now, confirm all the details which you have provided earlier. Then click on the "Install" button. 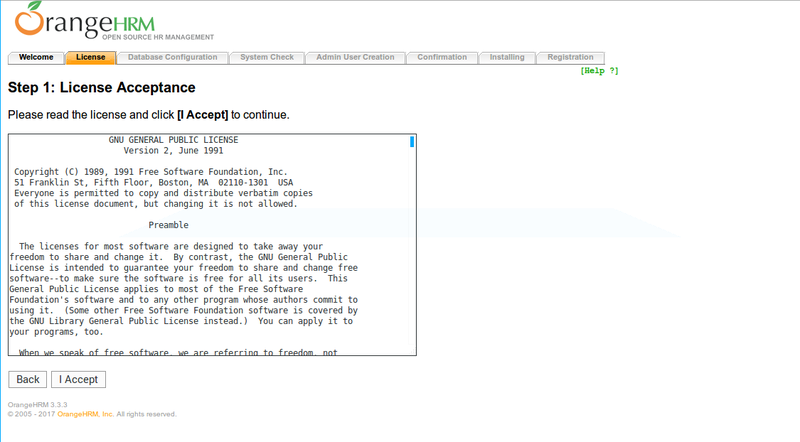 Once the installation is completed, you should see the following page. Click on the "Next" button, you should see the following page. 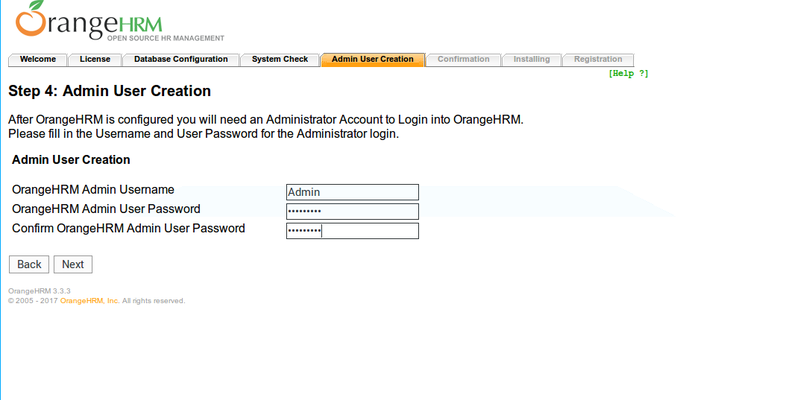 Provide your company name and click on the "Finish" button, you should see the OrangeHRM login page in below image. 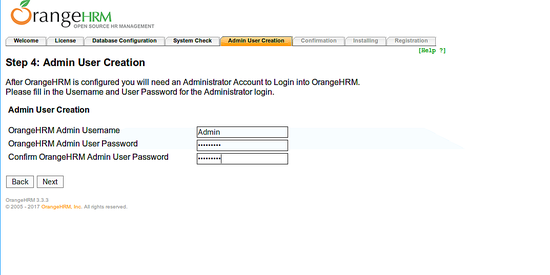 Provide your admin credentials and click on the "Login" button, you should see the OrangeHRM Dashboard in below image. 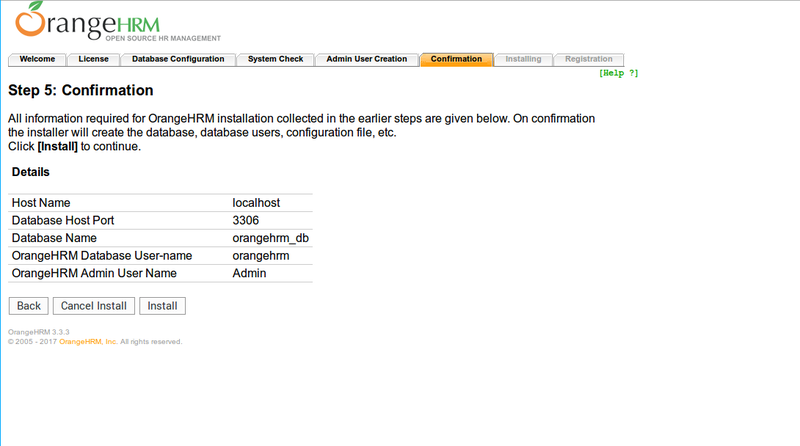 I hope, you have now enough knowledge to install and configure OrangeHRM in your server. Feel free to comments me if you have any doubt. 1. I found it fasterr to copy the /etc/apche2/sites-available/000-default to etc/apache2/sites-available/orangehrm.conf then edit the orange file. 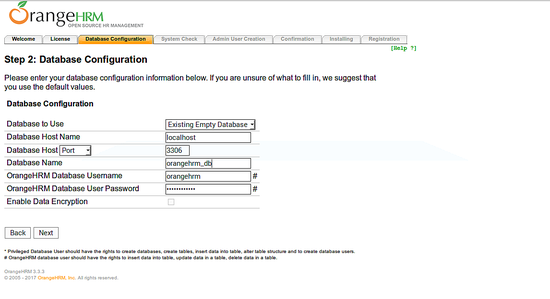 hi I am using MySql. I get error: could not determine the server's FQDN, using 127.0.1.1. Set the "ServerName" directive globally to suppress the message. The application works fine despite this error.